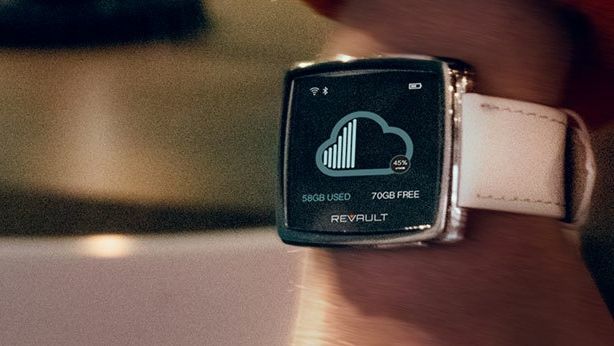 If you use cloud-based services like DropBox and OneDrive to transport your files then you're about to become as outdated as the cavemen who use USB sticks (or the puddles of primordial soup who still use floppy disks) with the ReVault smartwatch that doubles as wireless storage. This clever little device doesn't just tell you the time and throw you the odd email or text message while haemorrhaging battery life, like most smartwatches. Instead it sits on your wrist and can keep hold of your files – letting you connect your laptop, tablet and pretty much any device to it wirelessly to access them. Not only does this mean it's easy to open up a document on your laptop, edit it, then reopen it on a tablet without having to faff around with plugging in USB devices, but it also means you can expand the storage of your other devices quickly and easily. Struggling to fit all of your music on your iPhone 6's paltry 16GB storage? You can use the ReVault, which comes in 32GB and 128GB capacities, to hold all your music for you. It doesn't matter if you've got an iPhone, Android device, Windows PC or a Mac – ReVault can work with them all. It can also auto backup and auto synchronise your documents, and keeps them secure by encrypting them – but if you lose the watch, you lose your documents. You can tweak the look of the ReVault by choosing between a range of bands, as well as customisable faces. The colour display is protected by Gorilla Glass 3, it's water resistant and the battery apparently lasts around three days with regular use. When the battery does run out you can use a QI Wireless Charger to top it back up, and it will only take one and a half hours to fully charge. Before we get carried away though, a word of warning. There are no details on whether it can handle notifications, calls, messages etc - leading us to think that you may get the time, storage and that's it. It's a unique and possibly very useful feature for a smartwatch, and if you're interested in getting one you can back it on its Indiegogo campaign page. A pledge of $199 (around £126) will get you a 32GB version, while a pledge of $299 (around £190) will get you a 128GB model. You might have a bit of a wait though, as they probably won't ship until January 2016. You'll have to hold on to your floppies for a little longer.